Providing a basic power readout and no user interactive surfaces, the Anton Bauer Titon 90 V-Mount Lithium-Ion Battery can be used to power your V-mount camera or other pro video gear. The lightweight lithium-ion chemistry can provide up to 10 amps of current on a continuous draw and support peaks of up to 12.5 amps for five seconds. At the side of the chassis, an LCD display screen shows battery capacity in percent remaining, and when put under load it shows the exact remaining runtime. Using the D-Tap and USB ports you can power essential accessories on your rig or other small electronics. For those who prefer a basic battery without multiple display window options and mode selections. Additional information can be accessed and displayed via select Anton Bauer chargers (not included). The built-in display shows remaining power as percent. When the battery is connected to a camera or light, or otherwise put under load the display changes to show the remaining runtime. This information is available in most professional camera EVFs. 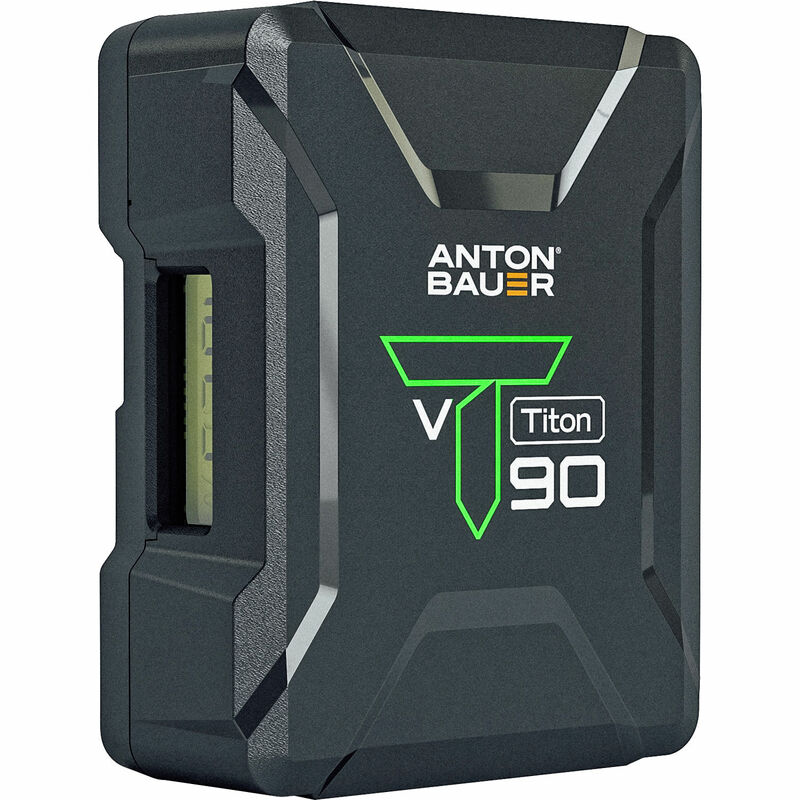 The Titon V-mount battery supports a continuous 10A total draw between the V-mount, D-Tap, and USB ports. It will support a 12.5A draw for up to five seconds to accommodate the high-power draw (power inrush) of devices when they start up. The battery capacity is 92Wh. The battery uses high-quality cells and robust electronics for power distribution and safety. It has a working temperature range of -4 to 140°F, although temperatures below 40°F can greatly reduce battery performance. The case is made from an ABS/polycarbonate blend. The battery can be charged with Dual or Quad V-mount LP and Performance chargers. You can also use other Anton Bauer chargers, as well as common competitive chargers; however, not all features and modes may be accessible with these other charges. Box Dimensions (LxWxH) 10.1 x 7.7 x 4.0"
Does this battery work with other v mount chargers, or only Anton Bauer?